St. Johns County Solid Waste Management sponsors many events throughout the year to promote community involvement and education in the ongoing effort to provide a clean and healthy environment. Printable Events Flyer. Are held at different locations during the year to collect household hazardous wastes, waste tires, and obsolete electronics from residential sources. Community Collection Days are held on Saturdays from 8 am to noon. Residents may bring in up to 10 tires per household free of charge. Dates & locations are advertised on GTV, radio, newspapers, this website, and county annexes and libraries. Help welcome nesting sea turtles back to their place of birth in St. Johns County by sweeping our beaches clean of trash and debris. 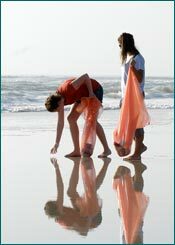 Our annual Turtletown U.S.A. Beach Clean-Up is held in April to prepare the beaches for female sea turtles who come ashore to lay their eggs in the early spring. Turtletown brochure. Join the thousands of volunteers all over Florida and the world in cleaning up our beaches and waterways every 3rd Saturday in September. This world-wide effort not only helps to clean the eyesore of debris but also removes many dangers to both people and wildlife. Six-pack holders, fishing line and nets, and strapping bands entangle animals while straws, balloons and plastic bags may be mistaken for food.